3Industry-Academic-Public Cooperation Center, Tokyo Metropolitan University, Minami-Ohsawa, Hachioji, Tokyo, Japan. Received 2 August 2011; 6 September 2011; accepted 9 October 2011.
kind of plant biomass wastes. ient methods for minimizing thermal denaturation [3-11]. must be taken into account . from Sigma-Aldrich Co. (St. Louis, USA). was prepared by the same method. sozyme was measured by UV absorption at 280 nm. cone oil bath at 90˚C for 30 min. Figure 1. 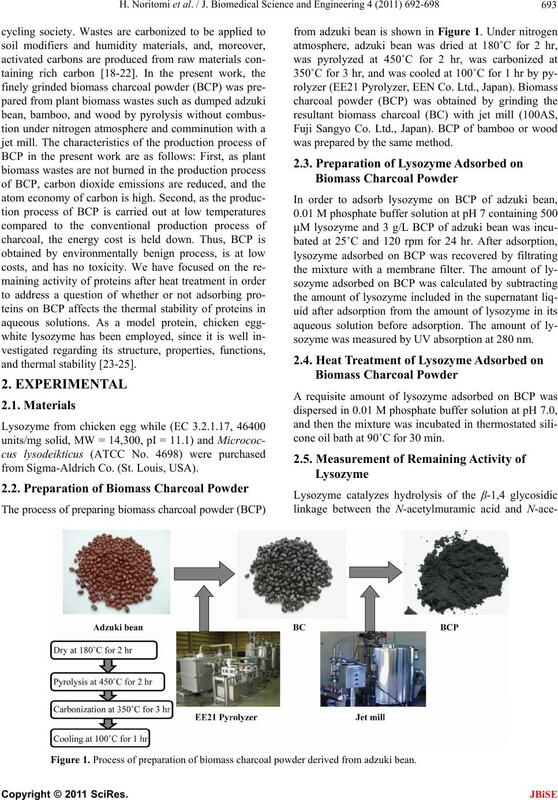 Process of preparation of biomass charcoal powder derived from adzuki bean. cooled in thermostated water bath at 25˚C for 30 min. vis spectrophotometer (UV-1800, Shimadzu Co. Ltd.). ment, and the high remaining activity is obtained. in the present work had its characteristics as follows. The mean diameter of BCP of adzuki bean was 7 μm. carried out at 90˚C for 30 min as an accelerated test. heat treatment was carried out, as shown in Figure 3(d). 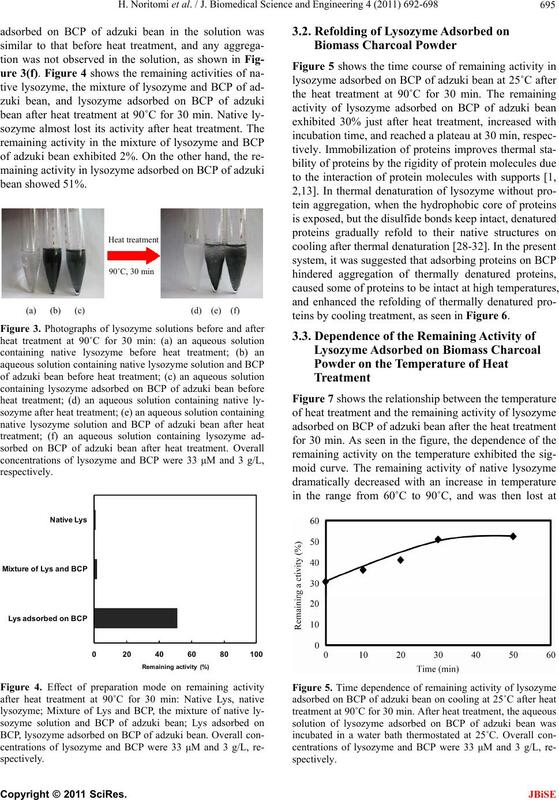 teins by cooling treatment, as seen in Figure 6. Figure 6. Schematic representation of thermostabilization of proteins adsorbed on BCP. lysozyme and BCP were 33 μM and 3 g/L, respectively. than that of bamboo or wood. tion: Practical approach, IRL Press, Oxford, 1-24.
tension of water in the stabilizing effect of polyols. 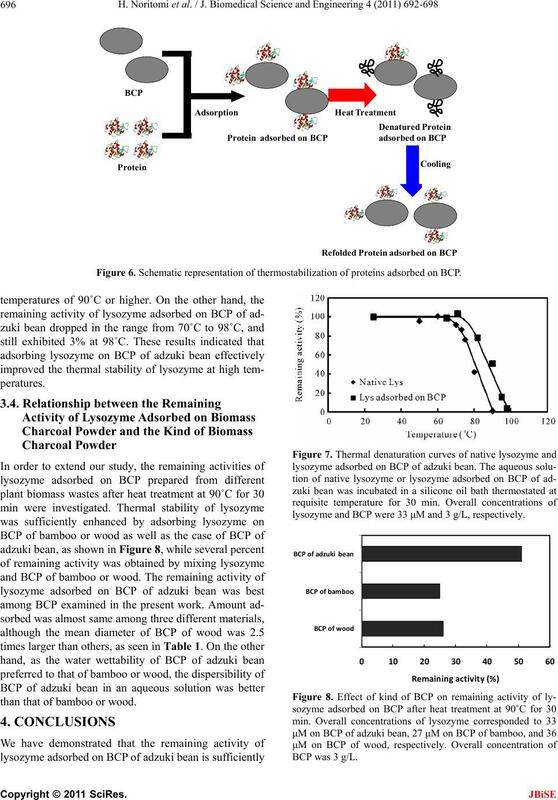 Journal of Physical Chemistry B, 102, 7058-7066.
sugars and polyols. Biochemistry, 18, 5191-5196.
teins in the presence of naturally occurring osmolytes. of osmolyte systems. Science, 217, 1214-1222.
hydrogenase. 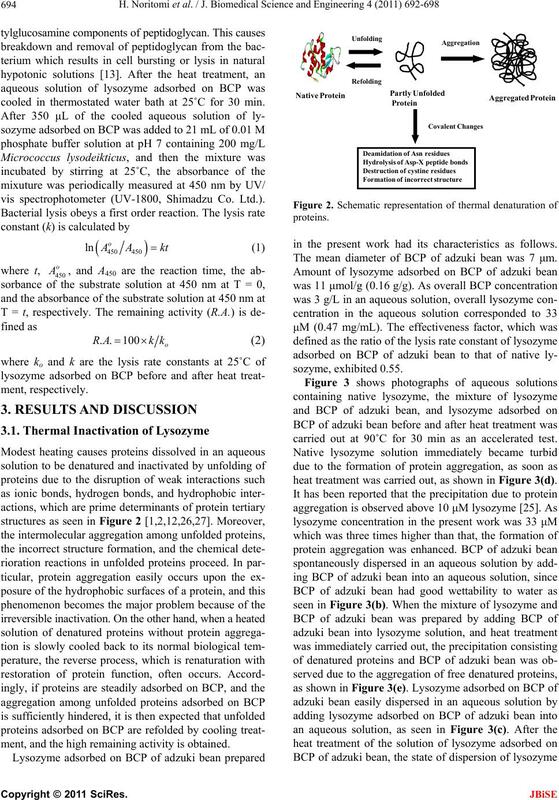 Journal of Biochemistry, 137, 349. Biochemical Engineering Quarterly, 12, 191-199. 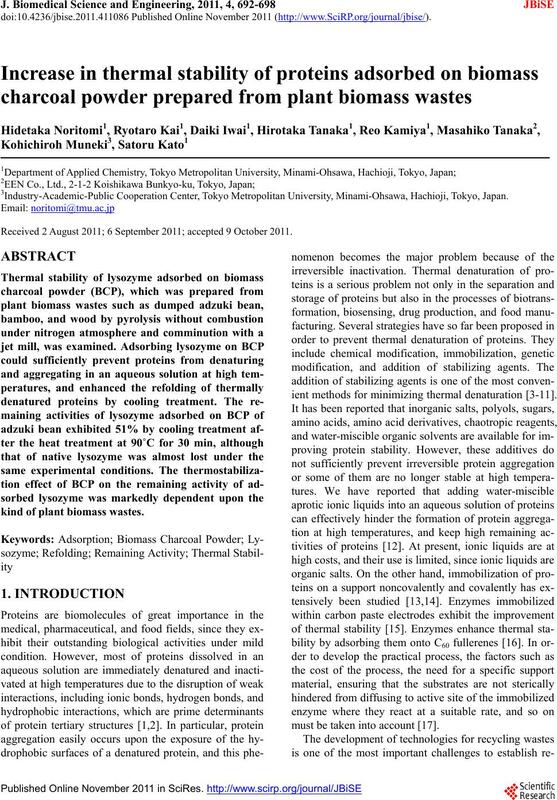 Noritomi, H., Minamisawa, K., Kamiya, R. and Kato, S.
Journal of Biotechnology, 2, 1-9.
molecules using biomaterials and nanobiotechnology. trodes. Analytical Chemistry, 69, 3124-3127. Asuri, P., Karajanagi, S.S., Vertegel, A.A., Dordick, J.S. Chaplin, M.F. 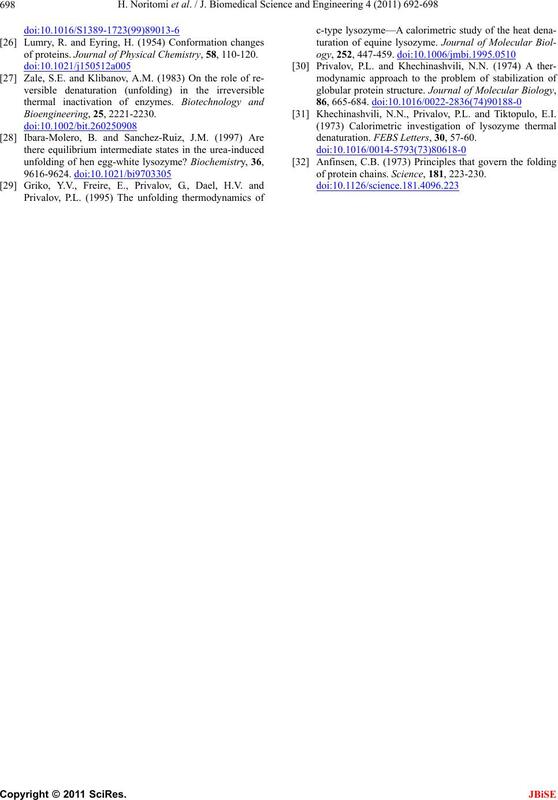 and Bucke, C. (1990) Enzyme technology. noso, F. (1994) Steam-activation of olive stone chars. Development of porosity. Carbon, 32, 1407-1413.
vated carbon from cherry stones. Carbon, 32, 1493-1498. Rivera-Utrilla, J., Ultera-Hidalgo, E., Ferro-Garcia, M.A. aqueous solution. Carbon, 29, 613-619.
chemistry and biology. Birkhäuser Verlag, Basel. of proteins. 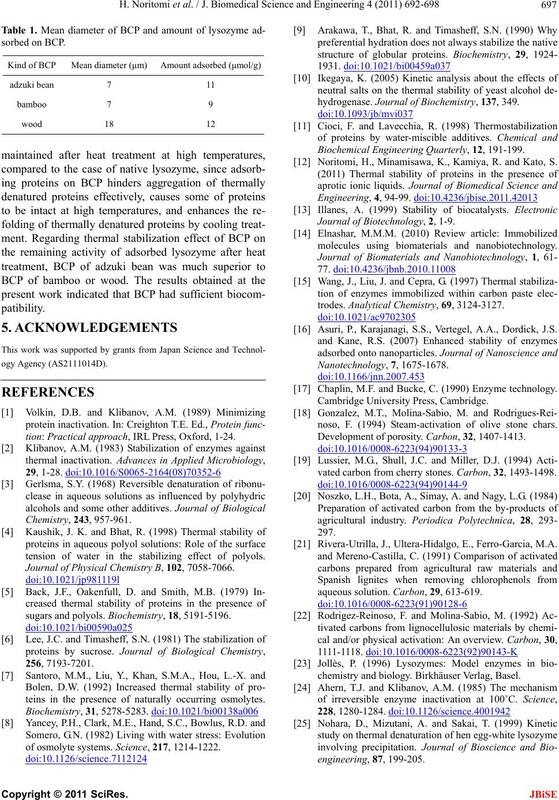 Journal of Physical Chemistry, 58, 110-120. Khechinashvili, N.N., Privalov, P.L. and Tiktopulo, E.I. denaturation. FEBS Letters, 30, 57-60.
of protein chains. Science, 181, 223-230.